Carl Barth,1896-1976 is a different author than Karl Barth, 1886-1968, and so has been nevered, despite the fact that several book titles written by Karl Barth have been entered in LT with the name Carl Barth as author. 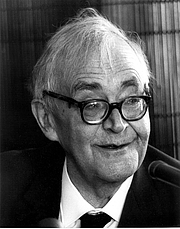 Karl Barth is currently considered a "single author." If one or more works are by a distinct, homonymous authors, go ahead and split the author. Karl Barth is composed of 27 names. You can examine and separate out names.